Our investment in Latin American Youth Center supports the Promotor Pathways program, which pairs disconnected youth with Promotors who provide long-term, extensive support. Angela’s story is a powerful, personal insight into how meaningful a Promotor can be for the life of each one of these young people. This story was written by the Latin American Youth Center. Angela* first came to the Promotor Pathway in September 2010 accompanying her sister, who was seeking support and case management. Angela sat quietly in support of her older sister, and after referring her sister to some programs, we began to ask Angela questions about her life. We soon realized that Angela was the sister in greater need. At 18, Angela was the young mother of a 1-year-old son and at high risk of being homeless. She had alternated between staying with family members, but was often asked to leave after her boyfriend—the child’s father—would cause problems in the home. While it took some time for Angela to open up, she eventually confided in her Promotor that she was struggling with a violent and unhealthy relationship and that she was using substances to deal with her struggles. Angela needed a mentor and a caring adult who would not judge her. With the help of her Promotor, Angela created a safety plan, called the domestic violence hotline, and developed a code language to use via text message to ensure her safety. Angela attempted to leave her boyfriend several times and went to domestic violence shelters, but would return to him. Statistics show that a woman will leave her abuser an average of seven times before finally ending the relationship, and Angela fit that pattern. Through it all, her Promotor would assist Angela every time she needed transport to a shelter or a person to talk to after being harmed. Angela began to identify her goals and her Promotor helped her to see that she could be an independent mother. Together, they began to gather her son’s medical records and important documents as well as navigate various benefits and community resources to move toward her goal of independence. Little by little, Angela began to pull away from her husband and gain control of her life. She began to move toward her goal of enlisting in the Army. Her Promotor encouraged her in moments of doubt, motivated her, and drove her to Army recruiting centers. She stopped using substances and, this summer, enlisted and received her date for basic training. After making arrangements with family to care for her son, her Promotor took her to the base in North Carolina. Angela continued to contact her Promotor and share her experiences. It has been amazing to hear her transformation. She is managing her mental health with therapy rather than substances, and has built a positive support network. She has gained self-worth and confidence in herself, takes care of her son, and is seeking a divorce to end her unhealthy marriage. 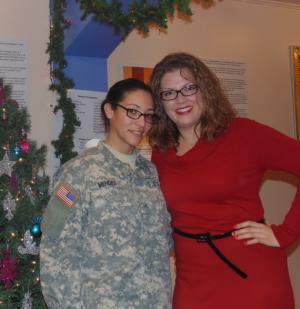 During Christmas, Angela came home from training to spend the holidays with her son. Her Promotor drove down to pick her up and brought her to our holiday party. We were able to see firsthand how this young woman has transformed into a strong and vibrant adult. It is clear that Angela has the confidence needed to continue fighting for her and her son to have a successful future.